Smart Technologies has released its SMART dry erase board and mobile app, SMART kapp, that will allow work to be saved and shared in real-time. SMART Technologies Inc. has introduced SMART kapp, its new digital capture board that offers an updated take on the traditional dry erase board for simple, remote collaboration. Like many collaboration vendors, SMART has emphasized integration of its digital capture boards with third-party tools, but not every business is using an enterprise-grade collaboration offering. SMART kapp, along with its mobile application -- the SMART kapp app -- is a standalone digital capture board that won't need a corporate network connection and doesn't integrate with UC platforms. SMART is focused on giving users a familiar, standalone tool that enables quick collaboration, while including remote employees, too, said David Maldow, analyst and associate publisher at Telepresence Options. "This is an upgrade from the classic dry erase board behind the desk or in a meeting space," Maldow said. "Up until now, there was no middle ground -- it was either a $10 dry erase board, or a $5,000 smart board that also has collaboration and video conferencing integrations that [businesses] might not need. For anywhere in which employees are writing on the wall and just want to be able to save and share some of that content, this tool is the middle ground." Dry erase boards have been a workplace and conference room staple for years, offering employees a place to brainstorm and collect ideas visually. But when people think up ideas that are worth saving, they have to transcribe that work elsewhere. Also, remote workers usually can't see the white board. 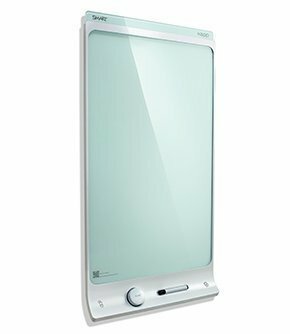 SMART kapp is a 42-inch glass pane, digital board that works with traditional white board ink markers and erasers. With SMART kapp app, a mobile application for iOS and Android, SMART kapp users in front of the board can snaphot, save and share their work on the board in the cloud and access them as PDFs or JPEGs using their Smart kapp app from their mobile device as a remote control. SMART kapp users can pair their tablets or smartphones to a SMART kapp board by scanning its unique quick response code or the device's near-field communication tag. Installation involves hanging the 35-pound board on the wall using brackets and plugging it into a power outlet. Many businesses won't need IT's help collaborating on the new board because it's used in the same manner as a traditional dry erase board. "All the brains for the technology are within the mobile devices [and SMART kapp app], so there are no buttons on [the] board," Maldow said. And because the new SMART board is not connected to the network, there are no added support or security steps that IT is responsible for. The kapp app activates live web-sharing and visibility of the board via a link for up to five users to follow along with the meeting, as well as access to the snapshot library of saved PDFs or JPEGs from past meetings and via integration with Evernote, said Neil Gaydon, President and CEO SMART Technologies. Because remote participants can join via a Web link, there is nothing to download and they don't need a user account, but they can follow along in real-time as a SMART kapp user writes on the board, he said. SMART kapp replaces the ad hoc measure of preserving white board work with blurry smartphone photos, Telepresence Options' Maldow said. "At any time during a meeting, the user on the [SMART dry erase board] can take a snapshot of the board from their [SMART kapp app] and it saves [the content] as a really clean capture -- this is the right kind of workflow people need," he said. With a list price of $899, the cost will also appeal to businesses looking for a simple collaboration offering, Maldow said. SMART said it will launch subscription services within the kapp app for advanced features for cloud collaboration, included live web sharing with PIN protection, expanding the number of concurrent web viewers, and advancing search and index tools. The company also plans on releasing a larger version of the SMART kapp board, and a mobile application for Windows operating systems in later releases this year, SMART's Gaydon said. While the simple nature and low price of the SMART dry erase board will appeal to many different industries -- including education -- some enterprises will want an audio component or video conferencing interoperability. With these features, users won't have to use two separate devices to view the content on the board during the meeting, said Rob Arnold, senior industry analyst at Mountain View, California based Frost and Sullivan Inc. Today, some mobile users -- such as Verizon customers -- would have to join a live video or audio conference using their mobile phone or landline, while viewing the board from another device if watching in real-time. It's yet to be seen whether the company will work on interoperability, which could raise the price or require more involvement from the IT team. "Right now, they are solving a simple problem with their first iteration [of the SMART kapp dry erase board] and doing it a low price point, Arnold said.